In conceiving this article on how to set up RAID, I remember that back in the 80’s and 90’s the computer environment in which I worked required fault tolerance. This means no data loss. All of our data was duplicated on mirrored drives, and was always available even in the event of a disk crash. 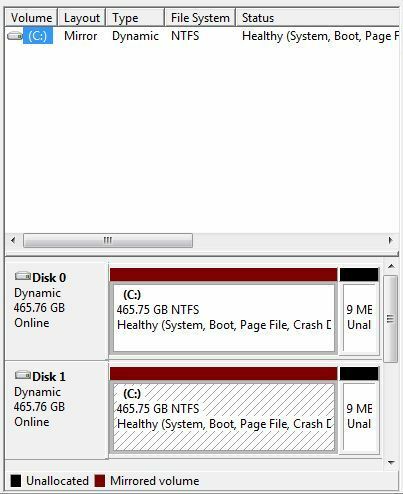 If a hard drive failed, it was replaced with a new blank drive that was then resynced in the background while operations continued using the healthy drive. Hard drive failures became almost transparent. With the recent replacing of my computer and all of its upgrades, I realized there was the possibility of adding a mirrored hard drive at a very attractive price. The RAID 1 and RAID 5 or mirrored hard drives are the only solution that will maintain fault tolerance. The hardware of most new motherboards will satisfy the requirements of the how to set up RAID (Redundant Array of Independent Disks), but if you’re not sure, check the specs. RAID controller software is built into all of the Windows Operating Systems since Windows 2000 and supports RAID 0 and RAID 1. Also is included in all of the Mac Operating Systems beginning with Mac OS X 10.4 and Disk Utility version 10.5 and it supports RAID 0 and RAID 1. The RAID system comes in two flavors plus several combinations of both. The first is the striped or RAID 0 configurations; this breaks the data into multiple parts to improve reading and writing speed. Consider a Name and Address file; the Name would be located on one drive, while the Address would be located on the second drive or split between a second and third drive. This allows the computer to acquire the data faster by having all of the drives in the set provide their part of the data almost simultaneously. The second is the mirrored or RAID 1 configuration; where the two disks are mirror images of each other. This is a fault tolerant set, where if one of the drives fails the other will continue to operate the computer. It then becomes a maintenance issue to replace the failed drive and perform the resyncing operation. A more historical view of RAID is covered by this linked article. The improvement in data throughput speed for computers using RAID 0 becomes more apparent in systems that heavily use the hard drives, such as servers. This can mean saving hours of data processing time on large servers farms. While in local workstations this advantage becomes negligible. RAID 1 offers almost no advantage in data transfer speed. Its advantages lie in its ability to dynamically maintain a duplicate copy of everything on the hard drive in real time. This allows you to be protected from certain types of hard drive and computer failures. While no protection is 100%, this one is very good. But, I still use the free online backup from Mozy as an off premise backup service for my most important data. This is done in the background, automatically several times a day. With my knowledge of what a fault tolerant system is, I began my expedition into how to set up RAID, by making my computer into one that is fault tolerant. The first step was to get a new hard drive; one that is the same make, model and speed as my existing hard drive. Next I had to physically install the drive in a drive bay far enough away from the existing hard drive as not to cause overheating in the other drive. Then the electrical connections were made; both SATA and power. This was the easy part, now I had to figure out how to tell the computer that this new drive was a mirror of the original C: drive. I spent several hours reading many RAID array tips on converting to a RAID 1 system and setting up RAID 0. This gave me the basics of what is a RAID controller and how to set up RAID conversion, but it did not have the specifics that I needed. The next thing I explored was the BIOS of the computer; it also was something that I decided against tinkering with. Finally I started to use the Windows 7 operating system itself. I opened the Disk Management table (shown above) and found my C: drive and the new drive (disk 1). The new drive was shown as being offline. By right clicking on the new drive (disk 1) a window opened allowing me to select “online”. This brought the new drive online. I did not name this new drive because I wanted it to become part of the C: drive pair. At this point I right clicked on the C: drive (disk 0) and opened a window that said “Add Mirror”, again which I selected. The process of creating the mirror drive ran for about two and a half hours, but I was able to use the computer in the interim. Since that time I have been working with a RAID 1 or mirrored computer system. In the Disk Management section under help there is a good SATA RAID tutorial which will allow you to manage hard drives and how to set up RAID systems. It’s a good resource. If you would like to comment, or add any information to this How to set up RAID on your PC page, please do so. Use the Contact Us form and we will respond as quickly as possible. If you would like to ask any questions, use the Questions and Answers form and an answer will be provided. Return from this page How to set up RAID to Build a computer home page.